“I didn’t know that sheep had personalities,” a friend said. “I thought they were just white blobs on a hill.” Most people think of sheep that way. You usually see them from a distance; you don’t get to know them. They are just white blobs on a hill with all the attributes that people who don’t know them assign to sheep – stupid, timid, meek, embarrassed at having done something wrong, and if you’re a cattleman out west or grew up on cowboy shows - damaging to grasslands. All stereotypes. Once you spend some up close and personal time with a sheep or two, you realize that they are not stupid. They know the importance of finding their next meal and will berate the shepherd who doesn’t provide food in a timely fashion. 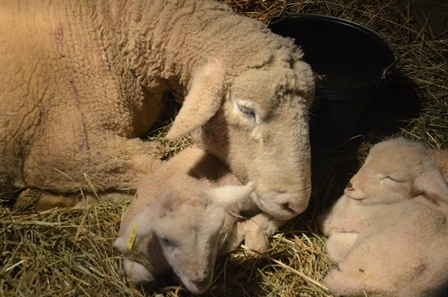 They may be seen as timid when they run from dogs and coyotes who will kill them, but they aren’t timid at all when they stand between their lambs and that same dog, risking fatal bites to protect their children. They aren’t meek when I move a newborn lamb into a pen. The mother runs interference, almost knocking each other over trying to keep their lamb from being adopted by another ewe. In thirty years of raising sheep I’ve never seen an embarrassed sheep, although I have seen other personality traits. 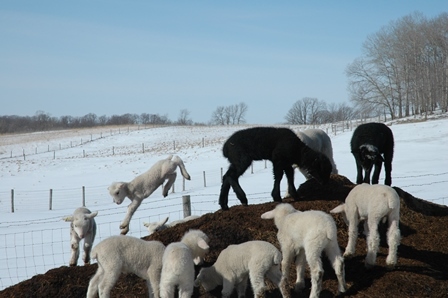 You see joy in a lamb bouncing and pronking around the pasture with other lambs. You hear loss in Dot’s plaintive calling for a dead lamb. You recognize good mothers in their infinite patience with their lambs. As for damage to grasslands, if the pasture is managed well, the sheep are moved to a new pasture when the old pasture needs time to regrow, then the sheep do no more damage than any other grazing animal. Knowing a sheep changes her from a blob on the hill to an actual individual, a real sheep, just as knowing a friend turns them from just another person we pass during the day to someone we are glad to see, an individual. That knowing gives us insight into their thought processes, into their actions. It allows us to accept them as they are. It works the same way with strangers, people who are different than us – people with a different color skin, speaking a different language, following a different religion. Our Somali friends frequently sound like they are arguing when they speak Somali together. But when I spoke to a group of Somali Elders about the possibility of a four day school week with a good translator, I knew what he said to them and I knew that what he passed on to me was a good translation of what they said. I knew they weren’t arguing; they were just speaking loudly and fast. Many people raise their voice when speaking to someone with questionable English. We don’t raise our voices because we’re angry, we raise our voices in the mistaken idea that if we speak more loudly that non-English speakers, like some deaf people, will understand us better. At first I thought that women who wore hijabs (the head covering of many Muslims) were doing so because their fathers or brothers or husbands made them dress that way. As I spoke to more Muslim women, I realized that their dress was their way if honoring their God, and that not all Muslim women felt the need to cover their heads to honor their God. One third of the children in our community school don’t speak English at home, most of them are African, Asian, or Mexican, they don’t look like the blonde, blue eyed kids who went to school with my daughters thirty years ago. And yet, they still love having their teachers read them stories, their favorite lunch is still pizza, their favorite class is still recess. Children are children, no matter what their race or creed or color. We fill our world with stereotypes, not real people. Just as a sheep is a white blob on a hillside, a person who looks different than my family and friends is just a blob on the hillside, not a real person with emotions, hopes and dreams similar to my own until I get to know them. And then, strangers can become friends, not stereotypes. I live on a small farm in west central Minnesota with my husband Dave, cat Oolong, dog Newton, 39 sheep, three goats and an alpaca. To learn more about the sheep, read my book Shepherdess: Notes from the Field, or From Sheep to Shawl: stories and patterns for fiber lovers. To learn more about the community, read my book The Faces of Change and the book Many Cultures, One Community: a book of stories and recipes. I have two new books, How to Paint a Sheep, a children's nonfiction picture book, and Tangled Web a novel, a story about Jenny Johnson who apprentices herself to a charismatic fiber artist and learns about knitting and dyeing as well as about herself..